The history of Freemasonry in the Eastern Archipelago is closely related to the East India Company, when their administrators, sailors and soldiers formed Masonic lodges in the region. The first settlement of the East India Company in Bencoolen, West Sumatra, was where the first Masonic Lodge in this region was warranted (1765). Sir Stamford Raffles, the founder of Singapore, was initiated in a small country lodge, Virtutis et Artis Amici Buitenzorg, near Bogor, Java. Brethren in Singapore having petitioned to form a Lodge there, received a Warrant for Lodge Zetland in the East No. 508 (1845). The first candidates initiated were Walter J Napier and William Henry Read, the later went on to become the first District Grand Master. The first effort to form a District was made by Neptune Lodge (1809). Attempts were made in 1827 and 1831 but were consistently turned down by the United Grand Lodge of England; the “fight and plea” for a District continued for the next 20 years. The District Grand Lodge of the Eastern Archipelago (DGLEA) was formed in 1858 with R W Bro W H Read as the first District Grand Master. He remained at its helm for 27 years. With the onset of the Second World War (1942-45), the Masonic Temples were ransacked and Freemasonry in Malaya lost everything-Temples, Warrants, furniture and documents. Many Freemasons were among the 50,000 POWs interred in Changi Prison, Singapore. Here, even under the trying conditions and ill health, secret Masonic Meetings were held. It is incredible to note that The Lodge St Michael (No.2933), Singapore held its first regular meeting 6 days after the end of the War and release of the Prisoners of War! The District has 40 Lodges and 19 Royal Arch Chapters scattered across three sovereign countries-Malaysia (East & West), Singapore and Thailand. West Malaysia 23; East Malaysia 5; Singapore 9; Thailand 3. The oldest Lodge being The Zetland in the East Lodge No.508 (1845) and the youngest being Oldham Lodge No. 9961 consecrated on 24th February 2018 in Singapore, the first in nearly 60 years. Membership numbers are around 2100 and 45% of them are also members of the Royal Arch. 18 District Grand Masters have ruled the District; the first Asian being RW Bro Dr Mustapa Osman (1967-1974). The longest serving being RW Bro JWY Eu (1974-2002) leaving a legacy of 28 years! 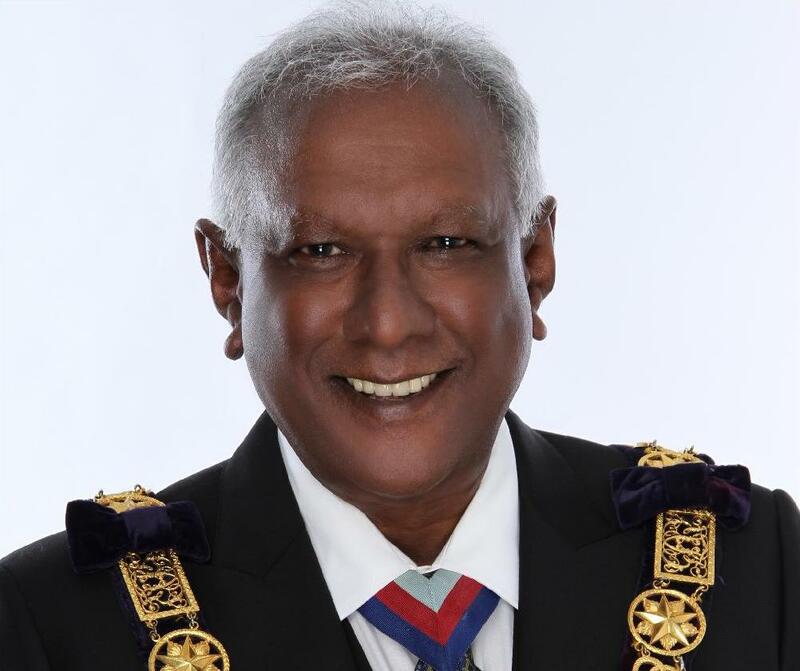 The current District Grand Master is RW Bro Dato Jeyaraj Ratnaswamy, who was installed on 20th February 2016. R W Bro Dato Jeyaraj Ratnaswamy was born in Kuala Lumpur and educated at the Kajang High School and the Victoria Institution, Kuala Lumpur. His tertiary education was at the University of Sunderland, England and at the Royal Melbourne Institute of Technology, Australia where he received a Masters in Finance. He is a Fellow of the Institute of Chartered Accountants of England & Wales and worked with Turquand, Young & Co., and later Peat, Marwick, Mitchell & Co., England and again with them in Singapore. He was initiated in Freemasonry on Saturday 6th December 1986 in Negri Sembilan Lodge No. 3552 and was installed Worshipful Master in 1994 and received District honours of acting Junior Grand Warden in 2013. He was exalted in Royal Arch Masonry on 9th August 1989 and was PZ in 1998. From December 2011 to March 2014 he served as a Trustee of the J W Y Eu Foundation. In 2009 he was bestowed with the honorific of “Dato” by the H R H Sultan of Pahang for his active participation business circles and supporting numerous charitable homes for the aged and orphanages, both in Malaysia and Overseas. He was installed as the R W District Grand Master & Grand Superintendent by the Assistant Grand Master Sir David Hugh Wooton, on 20th February 2016.